With 200 square inches of grilling space, this version of the celebrated George Foreman Lean Mean Fat-Reducing Grilling Machine grills 12 burgers or chicken breasts at once, perfect for entertaining. The 1500-watt appliance's appeal lies in its simplicity, convenience, and speed--not to mention its fat-fighting ability. Two grills cook burgers, steaks, chicken, sausage, fish, shrimp, and vegetables simultaneously from the top and bottom--indoors or outdoors. The resulting grill marks not only look appetizing but also contribute caramelized flavor. With your help we can reach more people and let them know about George Foreman Double Champion GR62 whether this product works or not. Love my George Foreman Grill, my 21 year old loves it too. Great for when you are in a hurry. Cooks everything to perfection. I own 3 different sizes, love them all!! 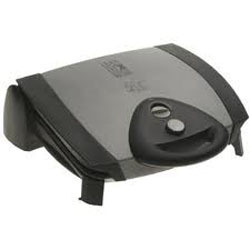 I tried the Foreman Grill for the first time recently and the food tastes alright but you just don't get the rich, smoky taste that you would from a charcoal grill or even a propane grill. One thing I didn't like about the Foreman Grill is the little plastic tub where the fat drips into. I think that this takes away all the juiciness and the flavor of whatever you're grilling. But I guess you can just drip the fat onto the the meat after you're done grilling which is what I do. Overall, this is a good product if you don't like cooking outside or don't have time to grill the traditional way. This is a nice grill, we have a family of seven which can be a challenge. The down side is the weight, its very heavy and difficult to manage and store. A great product overall, it heats up really fast and cleaning is a breeze. Simply wipe with a wet sponge and it is done. The plates heat up evenly and cooks meat very well. The cooking time is great too, I save sometime half the time I would take me on a stove top.